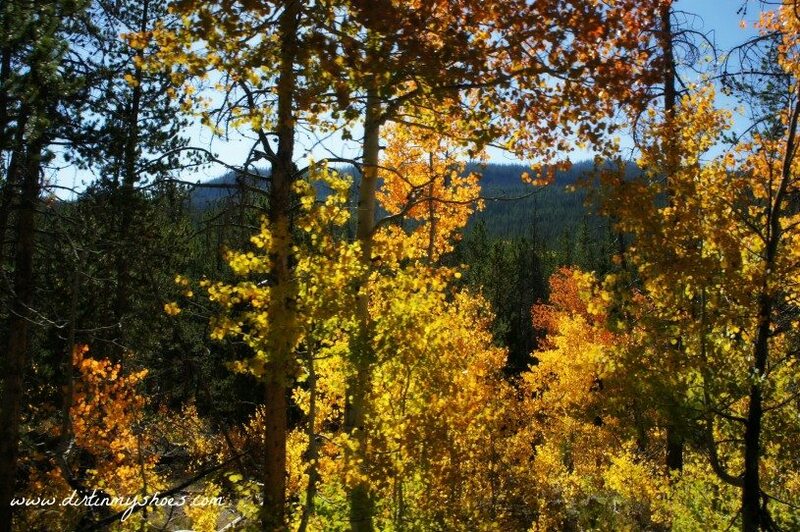 Autumn is in the air and the leaves are glowing along the Mirror Lake Highway! Pack up your car with freshly pressed apple cider, warm sweaters, and pumpkin-flavored anything while you enjoy some of the best fall colors in Utah. Make a day of it and hike to a gorgeous alpine lake or to the top of a peak, all while reveling in the vibrant colors that surround you. Because of the high elevation of this area, this should be one of the first places you go to view the changing fall colors in Utah. The leaves begin to lose their green sooner than you think, making the Mirror Lake Highway a great place to get your first taste of autumn (especially if you are itching to see the leaves change as soon as possible). We drove the highway on September 12, and would recommend leaf peeping here anywhere from the middle of September to the beginning of October. I have provided a picture tour of the Mirror Lake Highway as well as some of my favorite stops to make along the way. Here we go! 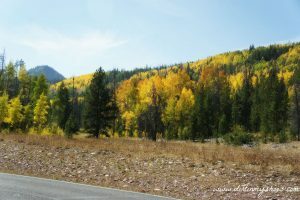 While leaving Kamas and driving along the Mirror Lake Highway, the green leaves begin to transform into stunning reds, yellows, and oranges on the hillside. 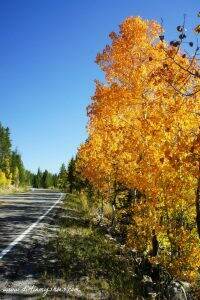 The trees along the highway look like they are on fire and are some of the best fall colors in Utah! The leaves in this area are incredibly vibrant and seem to glow neon in the light of the sun. Everybody loves a good waterfall, so be sure to stop and enjoy the Provo River Falls. 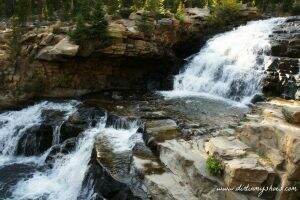 A short walking path will take you to numerous dramatic waterfalls and is an amazing place to relax and take pictures. From the Provo River Falls to about Ruth Lake, the Mirror Lake Highway is mostly framed by pine trees so you won’t see much color along this stretch. Check out some other fun activities in the area! 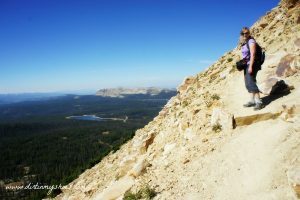 Hike to the top of Bald Mountain for sweeping views of the lakes and mountains of the Uinta Range. 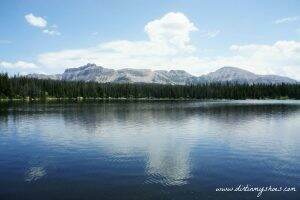 A short and family-friendly activity is the hike to Fehr Lake. This trail is only one mile roundtrip and ends at a gorgeous alpine lake with incredible views of Bald Mountain. Just down the road is Mirror Lake, a sparkling blue lake that is the hub of activity along the highway. Try your hand at fishing along the shore, or if you feel extra adventurous, bring along a canoe, kayak, or raft and head out into the refreshing water. A beautiful nature trail gives you 360-degree views of the lake and surrounding mountains. Bring a picnic and stay for a while! 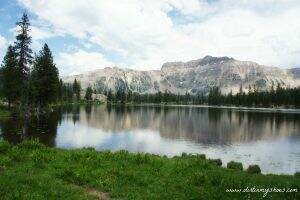 One of my favorite hikes in the area is the hike to Ruth Lake. This trail is great for hikers of all abilities and provides dramatic and stunning views of Hayden Peak reflected in the waters below. 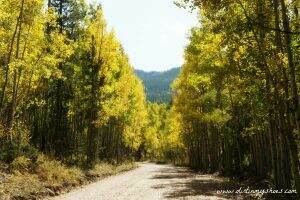 Continuing down the Mirror Lake Highway, we found a giant grove of golden aspens glistening in the sun. The beauty of this area is overwhelming! Find a pullout and take a few minutes to snap some great pictures and marvel at the incredible colors. 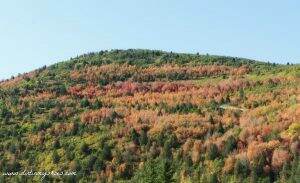 I’m an autumn leaf enthusiast, but I can’t say that I have ever seen colors this bright anywhere in Utah! 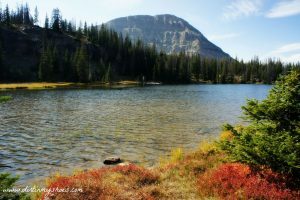 I highly recommend taking a detour off of the Mirror Lake Highway and heading down the dirt road to Christmas Meadows. We were engulfed in color along this drive and loved every minute of it! Christmas Meadows is located approximately 33 miles from Evanston, WY. There is no sign for the turnoff if you are coming from the Utah side, but the dirt road is located just after the turnoff to the Stillwater Campground. A perfect ending to a perfect day….the glorious Christmas Meadows. 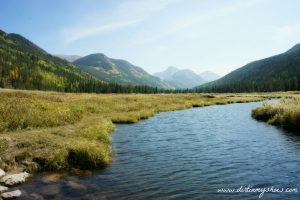 The meadow opens up with stunning views of the mountains ahead and a winding river that is perfect for fishing! We had an awesome day leaf peeping along the Mirror Lake Highway! Plan on two or three hours to drive the highway, not including any stops or hikes along the way…but definitely get out of the car a few times to enjoy the crisp mountain air! From Salt Lake City, take Interstate 80 East for approximately 30 miles until you reach Highway 40, exit 146. Head south on Highway 40 for about 3 miles before taking Exit 4 to Kamas/Park City. Turn left onto Highway 248 and follow the road for 12 miles. When you reach Main Street, take a left and drive two blocks until you reach Highway 150. Turn right onto Highway 150, roll down your windows, and get your camera ready to take some pictures of some of the best fall colors in Utah! Do you have a favorite stop along the Mirror Lake Highway? 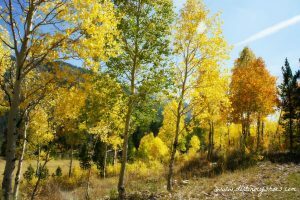 Have you found a great place to see the fall colors in Utah? Let me know in the comments below! It’s really hard to time, but usually mid-September! I am a huge fan of hiking in the fall! I’ve never been to Mirror Lake though- I will have to go there!! I personally love hiking Squaw Peak in the fall and Cascade Mountain up Provo Canyon. Views and colors are incredible. Thanks to John as well for introducing us to your awesome blog (we met him for work).